The young pianist, Daniil Trifonov, is an astonishing musician. That’s not just my view, but the view of critics around the world. I had heard so much about him and have all his recordings, but I had never met him, or heard him play live. So I was absolutely delighted when he agreed to come on ‘Sarah’s Music’. I spent my entire train journey to Hamburg, reacquainting myself with his Chopin recordings, released to rave reviews in 2013 when he was just 22. Hamburg is the home of Steinway pianos who were offering Daniil the choice of 3 beautiful instruments to play on for his concert there. So, the first thing we did on arrival in Hamburg (at 10pm! ), was to go film the selection of the piano. As we were waiting for Daniil to arrive, I was thrilled to bump into another incredible pianist – the legendary Menahem Pressler – who was also choosing his piano for his concert a few days later. It was touching to then see the meeting between the two and watch the elder Menahem give advice to the younger Daniil as which was his favourite piano and why. Rupert Wagg, Head of Digital at Deutsche Grammophon, suggested attaching a GoPro camera to Daniil’s head so we could get a bird´s eye (ok, a pianist´s eye) view whilst he was making his choice of pianos. Daniil was a great sport and you can see a short clip of this playing in the episode. Daniil and I had a fun interview in the Hamburger Rösterei, which is THE place to get coffee in Hamburg, by the way! 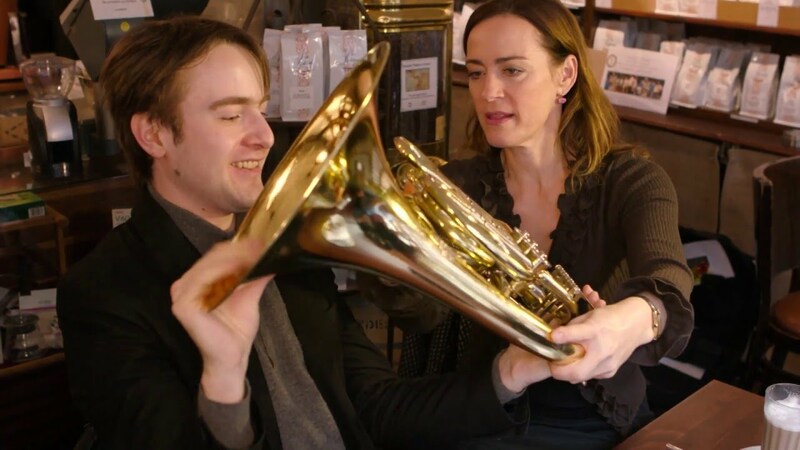 And where the customers didn’t even flinch when I presented Daniil with my horn for the Horn Challenge…you’ll see how he did on the programme.